Industrial couplings keep your equipment running properly. Couplings are key to preventing too much torque, keeping power shafts aligned, and adjusting for variations inherent in any power transfer. From managing power transition to breaking off connections to prevent damage, your couplings are pivotal to keeping your equipment operating optimally. Kor-Pak has been supplying our customers with industrial couplings for 40 years. We are recognized distributors for top manufacturers across the country. For coupling sales and service, our customer have come to rely on Koe-Pak. Kor-Pak supplies a wide variety of industrial couplings that are successfully used on a plethora of applications for various industries. 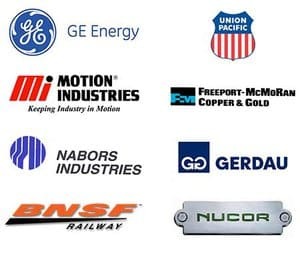 Kor-Pak represents major reputable industrial coupling manufacturers who have set a benchmark for high-quality products and are used and well-recognized around the world. Industrial couplings from Kor-Pak meet the needs of virtually any application. As a distributor of the major brands of couplings, our products include elastomeric, large gear, soft start fluid couplings and high purpose spindles as well as general purpose couplings. Contact us to discuss your application and we will be sure the industrial coupling you receive is just the right one. We have relationships with the top global manufacturers of industrial couplings. As s distributor with global resources, we ensure the coupling you order is exactly what you need. Kor-Pak can rebuild your existing couplings for a competitive price. Contact us today for a quote. TB Wood's is an industry leading designer and manufacturer of mechanical power transmission equipment for industrial applications. Our mechanical product lines include: synchronous, v-belt, and belted variable speed drives; grid, disk, jaw, gear and elastomeric coupling products; sheaves and bushings, sprockets and clutches. Registered trademarks include Sure-Flex®, Dura-Flex® Form-Flex®, G-Flex® and QT Bushing®. TB Wood’s offers a solution for any coupling application with several lines of high-performance couplings. Wood’s lines of elastomeric, disc and gear couplings have a reputation of reliability and flexibility. Whether you choose from our Sure-Flex®,Dura-Flex®, Form-Flex®, Jaw, or Grid Couplings, you can be certain you’re getting the very best of Wood’s performance and quality. Built for durability, designed for extreme conditions Ideal for use with variable-speed and variable- torque applications No lubrication No maintenance 4-way flexing action absorbs all types of shock, vibration, misalignment and end float The TB Wood's Coupling Selector can help you select the appropriate coupling for your application, and you can contact a Kor-Pak representative for assistance. A proven lubrication system that eliminates fretting, corrosion, freezing, and sticking. Constant pitch diameter and constant speed are maintained under varying torque loads. Contact a Kor-Pak Representative today for more information about TB Wood's Couplings and Belted Drives.